So you’ve purchased a brand new bespoke Chesterfield sofa. It looks gorgeous, creates a spectacular impact in your living room and it’s the talk of all your friends when they visit. 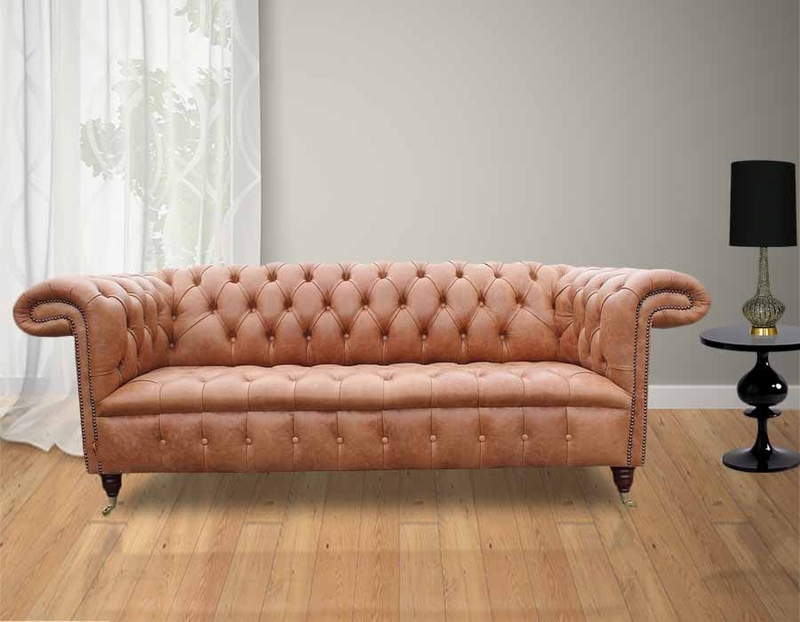 Chesterfield furniture is highly sought after with its stunning button detailing and antique distressed appearance. As time goes on, though, the high-impact vintage features and bespoke leather finish may not look as good as they once did. So what do you do about keeping it clean and looking polished and new for longer? In this brand new guide, we’ll give you a few simple tips on how to care for your leather Chesterfield sofa. Make sure you buff over your impressive Chesterfield daily. Once a day, dampen a non-abrasive cloth with some distilled water and wipe down the entirety of the sofa, removing any dust, pet hair, dirt and rehydrating the leather finish. Use distilled water only as the chlorine in most tap water can damage leather over time. Once a week, clean your leather sofa thoroughly and ensure you reach the buttoned crevices as these can catch dirty and it tends to accumulate here quickly. Avoid using any all-purpose cleaning sprays or furniture polish unless specifically designed for leather as these can also damage your settee. For an easy way to remove dirt and debris, use your hoover attachment and gently run over the settee paying particular attention to the crevices and hard to reach places. For best results, use a soft brush attachment and don’t use your typical vacuum head as this could mark the leather. Keep your Chesterfield leather settee conditioned using a specially designed conditioning treatment. Prices tend to range from £5-£30 for a leather care kit so shop around for one that has good reviews or has been recommended to you. 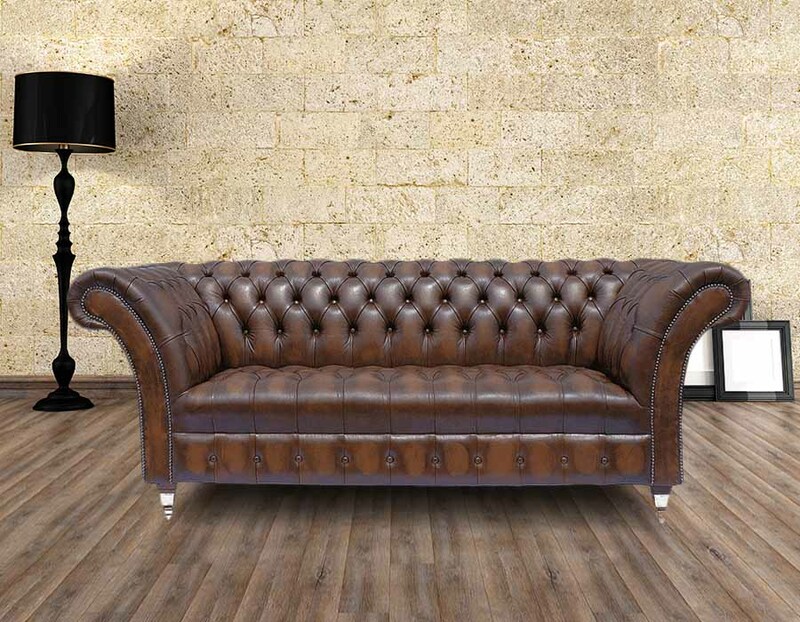 A leather conditioner is really important when purchasing any leather sofa, not just a Chesterfield. These conditioning products keep the leather from drying out and developing any unsightly cracks. They tend to have a creamy consistency to help the leather stay supple and this is an essential part of caring for your leather sofa if you want it to stand the test of time. It’s recommended that you carry out a conditioning treatment on your settee every few months to keep it looking brand new. If you don’t fancy forking out on a leather conditioner, you may want to consider a cheaper remedy using natural ingredients. Some have recommended making a mixture of one part distilled white vinegar and two parts of linseed oil then applying to the leather in circular motions using a cloth. Please note: If in doubt on how to clean your Chesterfield sofa, please seek advice from a professional. Designer Sofas 4 U accepts no liability for injuries or damages you sustain following the advice on this website. Buff, Buff and Buff Again! Buffing your sofa with a microfibre or soft cloth is ideal for getting out small scratches and marks. Buffing regularly can also help to bring out the leathers natural shine and restore a faded appearance. Marks and scratches can be diminished and faded by buffing however other scratches may be a little tougher to get out. For slightly deeper marks, try applying olive or baby oil on to a cotton swab and lightly rubbing it directly on to the scratch. Leave it for an hour and it should have repaired itself. Do you have a leather Chesterfield sofa? How do you keep it clean? Get in touch with us via Facebook or Twitter and let us know! We could feature your tips in our next article!